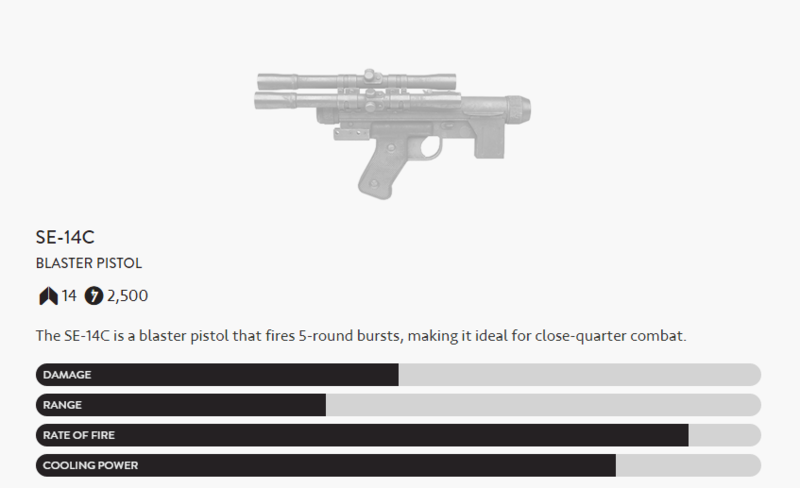 The DH-17 is a fully automatic blaster pistol. 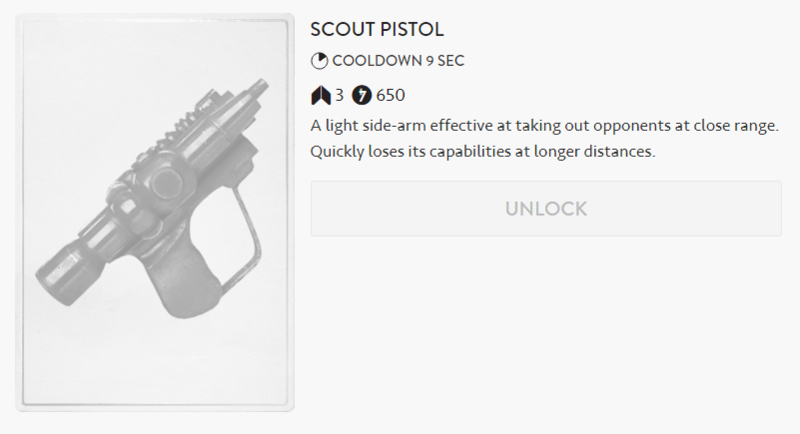 Its high rate of fire, along with reasonable accuracy, make it an ideal weapon for medium-range combat. The DLT-19 is a heavy blaster with an excellent rate of fire that deals heavy damage at long range, capable of pinning down troops and taking out large groups of enemies. 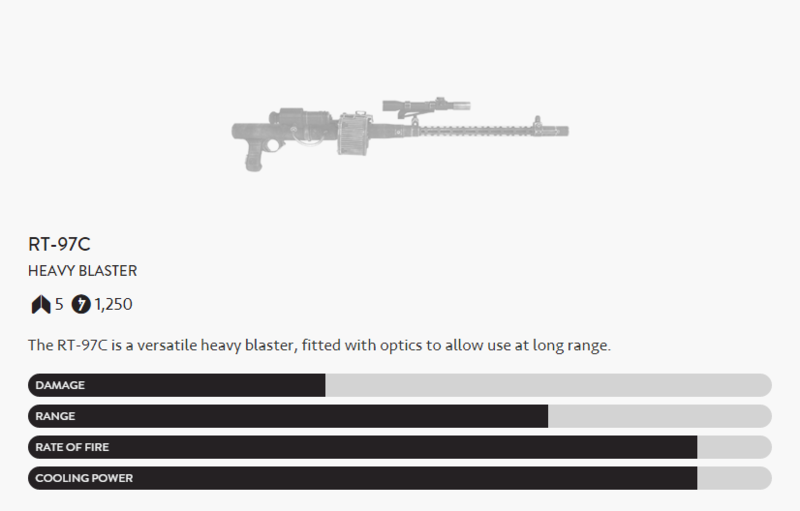 The RT-97C is a versatile heavy blaster, fitted with optics to allow use at long range. 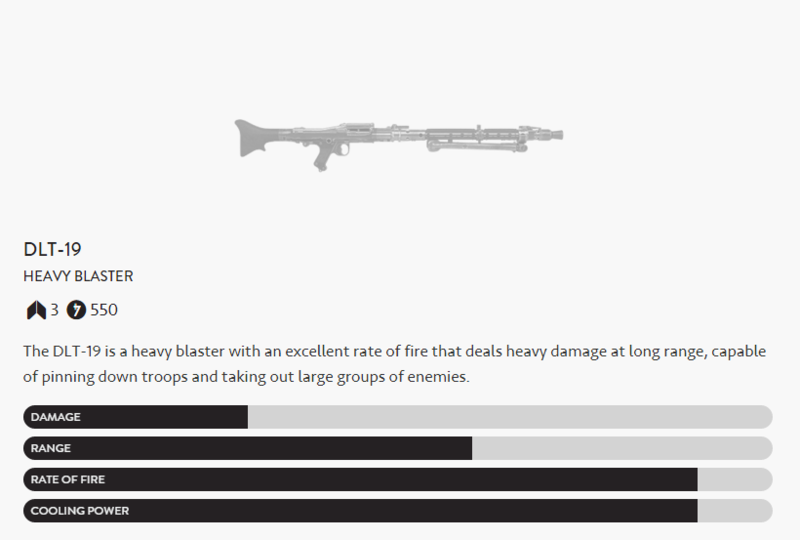 A280C is a sturdy and powerful blaster rifle that has a high rate of fire and excellent firepower. 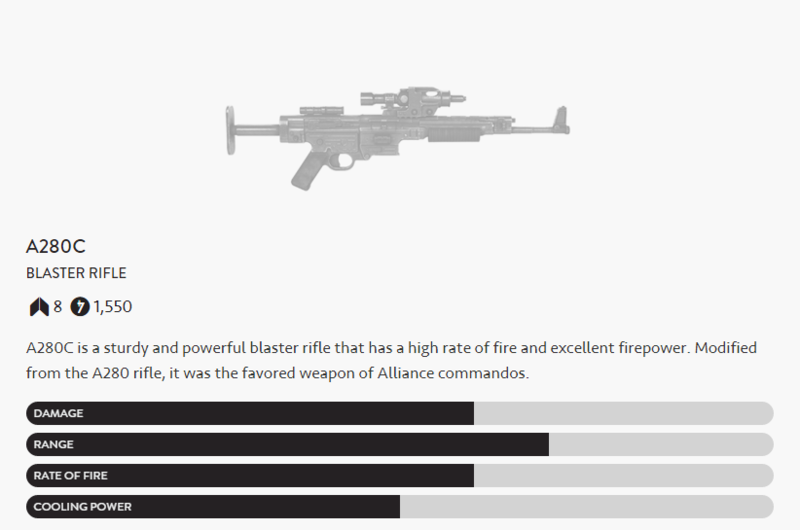 Modified from the A280 rifle, it was the favored weapon of Alliance commandos. 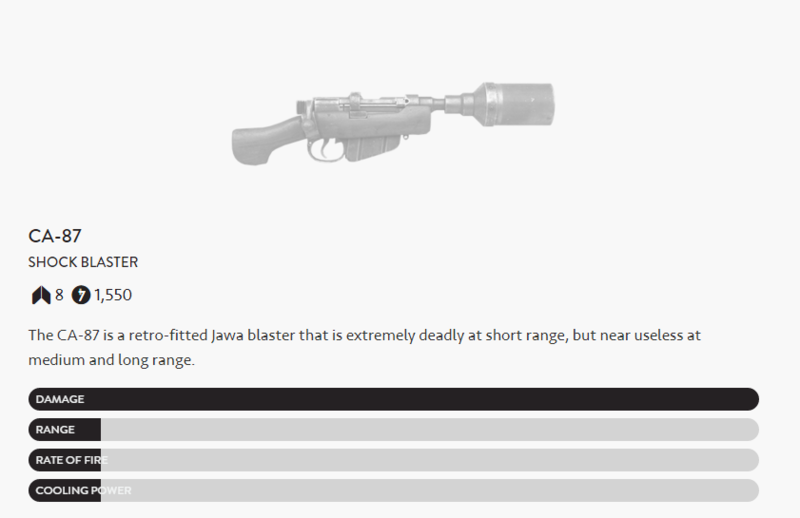 The CA-87 is a retro-fitted Jawa blaster that is extremely deadly at short range, but near useless at medium and long range. 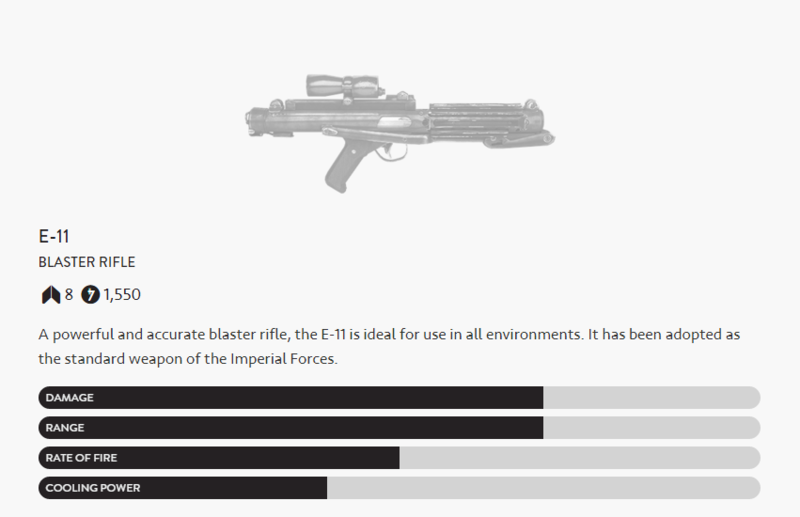 A powerful and accurate blaster rifle, the E-11 is ideal for use in all environments. It has been adopted as the standard weapon of the Imperial forces. 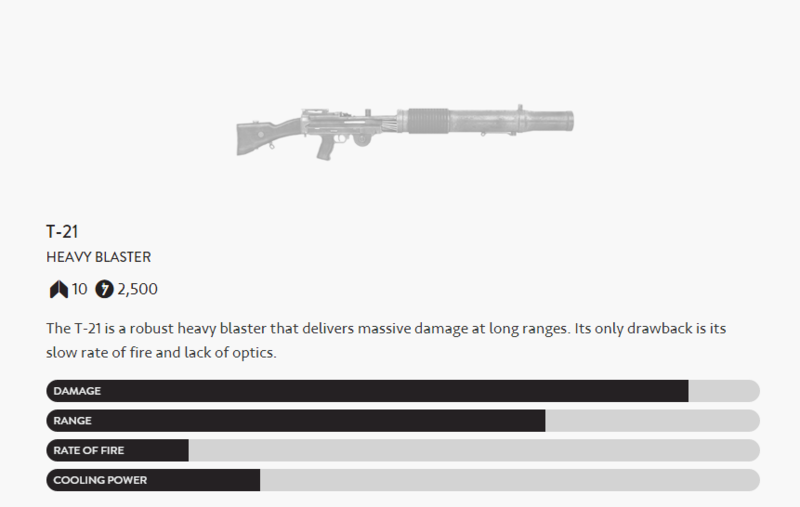 The T-21 is a robust heavy blaster that delivers massive damage at long ranges. Its only drawback is its slow rate of fire and lack of optics. 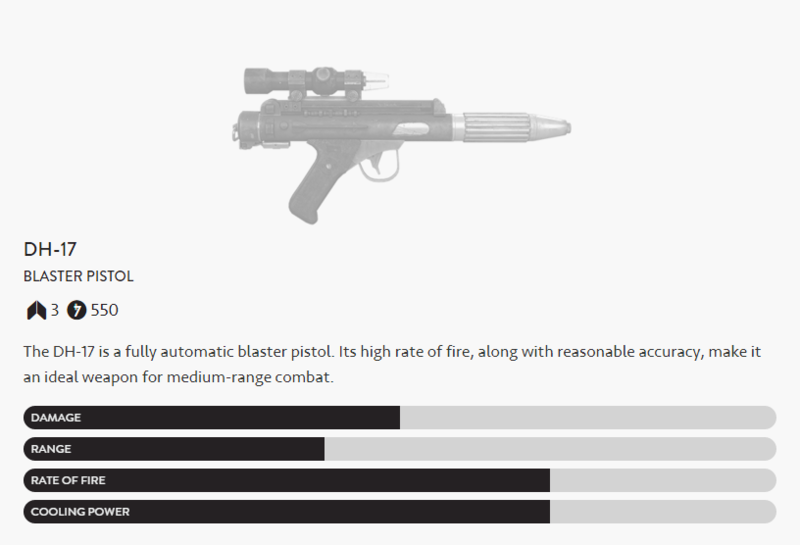 The SE-14C is a blaster pistol that fires 5-round bursts, making it ideal for close-quarter combat. 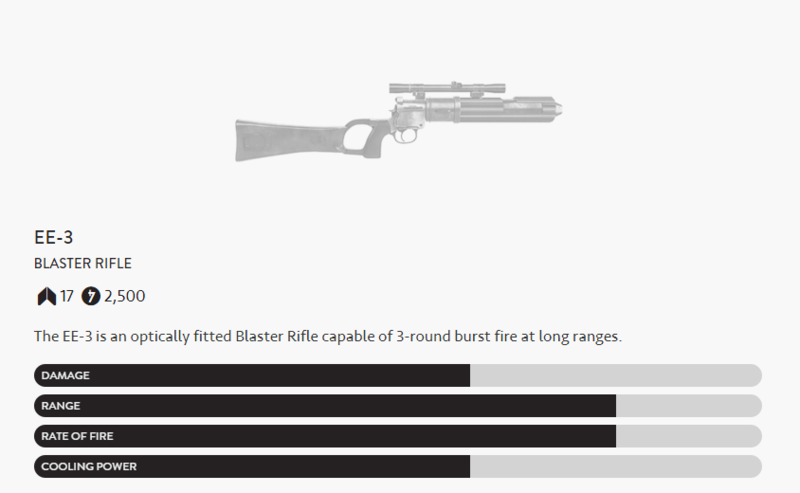 The EE-3 is an optically fitted Blaster Rifle capable of 3-round burst fire at long ranges. 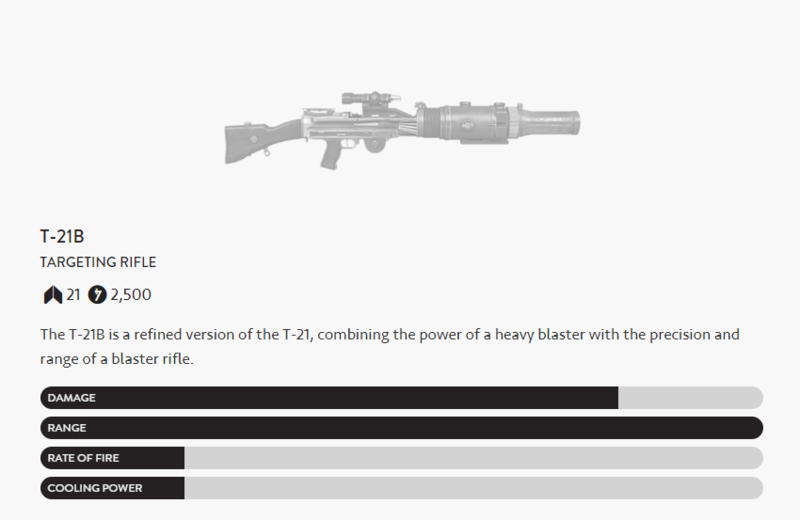 The T-21B is a refined version of the T-21, combining the power of a heavy blaster with the precision and range of a blaster rifle. 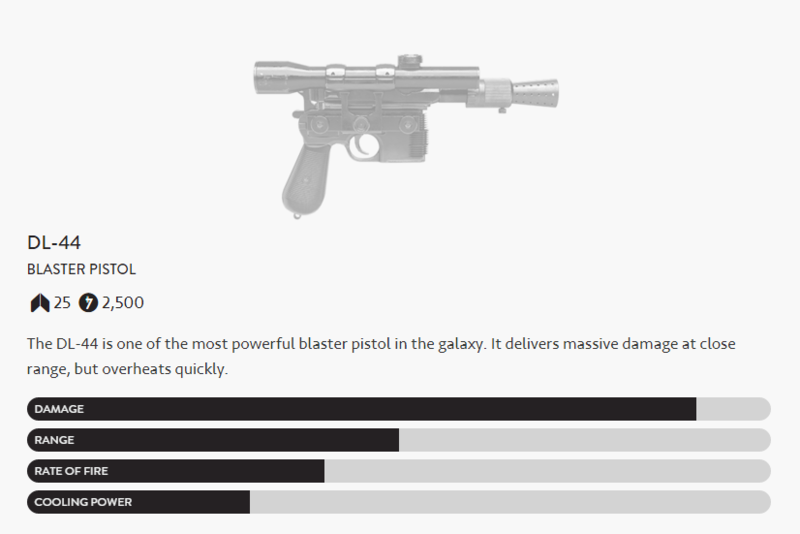 The DL-44 is one of the most powerful blaster pistols in the galaxy. It delivers massive damage at close range, but overheats quickly. 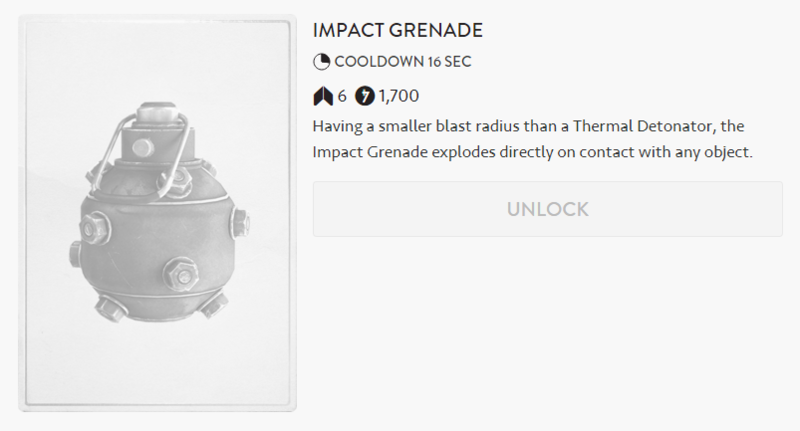 The most popular and widely used grenade in the galaxy. It is easy to use and has deadly results. A light side-arm effective at taking out opponents at close range. Quickly loses its capabilities at longer distances. 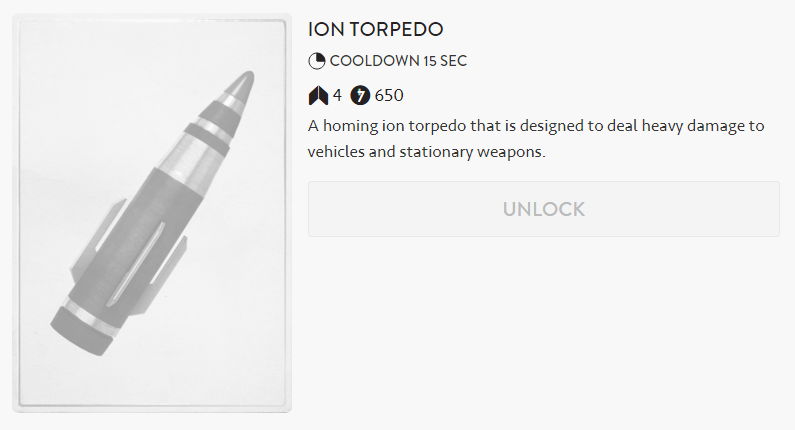 A homing ion torpedo that is designed to deal heavy damage to vehicles and stationary weapons. 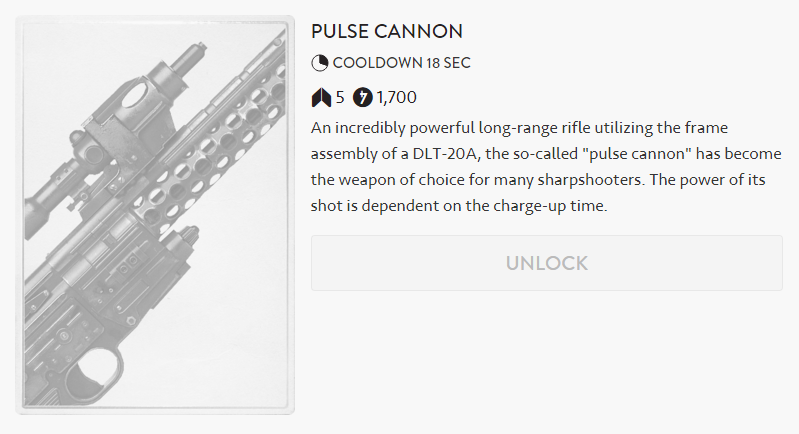 An incredibly powerful long-range rifle utilizing the frame assembly of a DLT-20A, the so-called "pulse cannon" has become the weapon of choice for many sharpshooters. The power of its shot is dependent on the charge-up time. 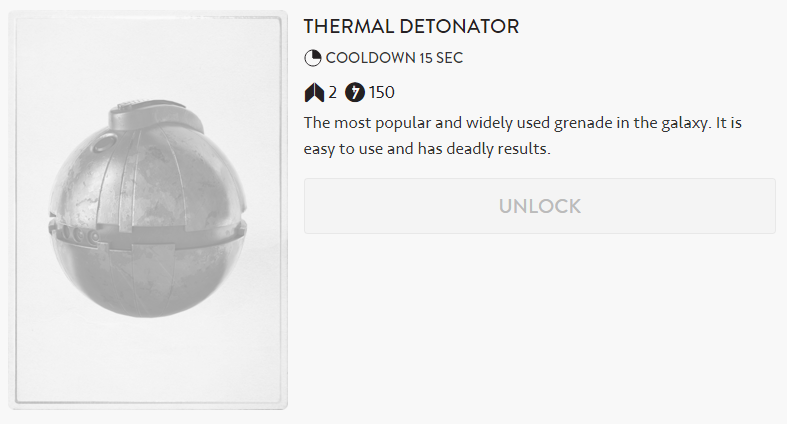 Having a smaller blast radius than a Thermal Detonator, the Impact Grenade explodes directly on contact with any object. 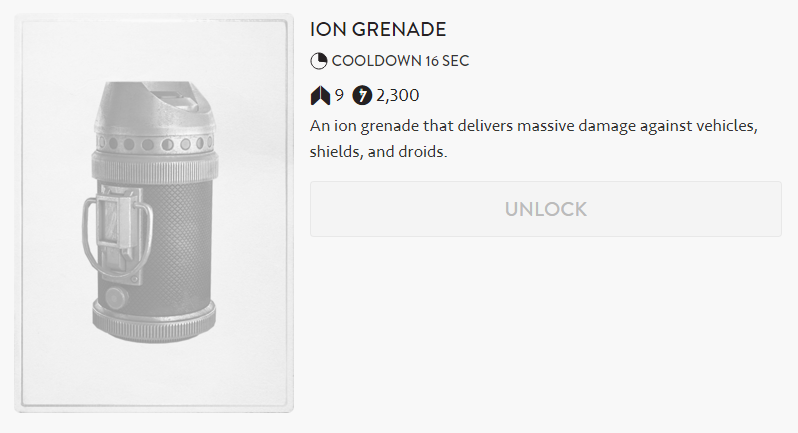 An ion grenade that delivers massive damage against vehicles, shields, and droids. 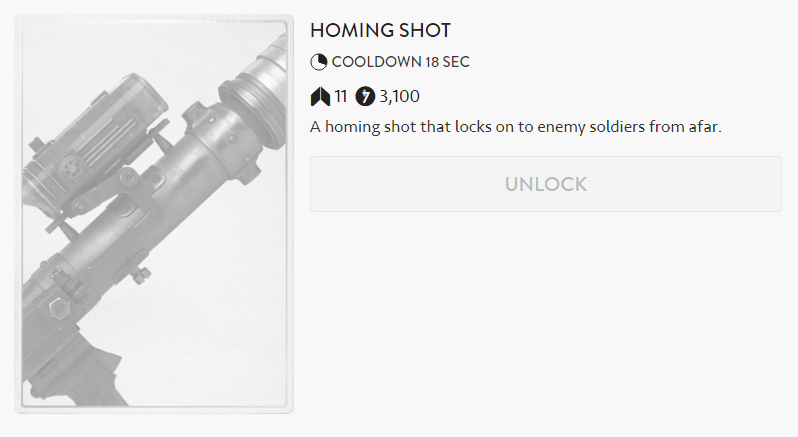 A homing shot that locks on to enemy soldiers from afar. 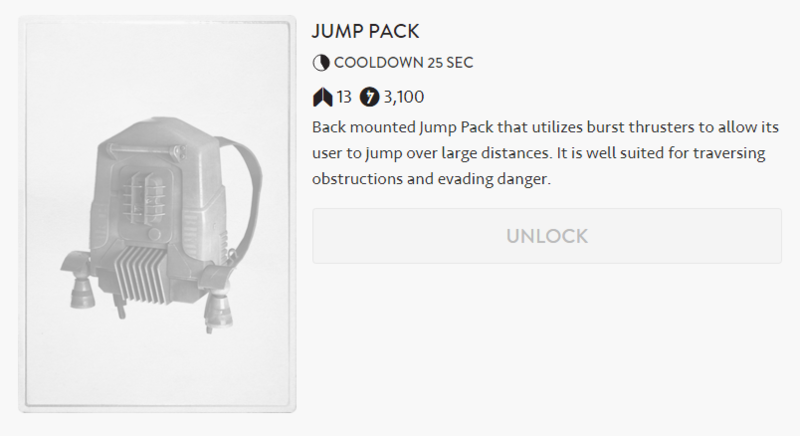 Back mounted Jump Pack that utilizes burst thrusters to allow its user to jump over large distances. It is well suited for traversing obstructions and evading danger. 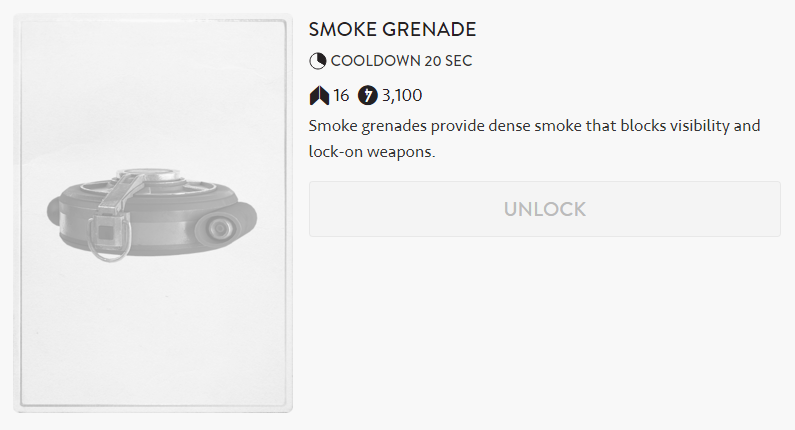 Smoke grenades provide dense smoke that blocks visibility and lock-on weapons. 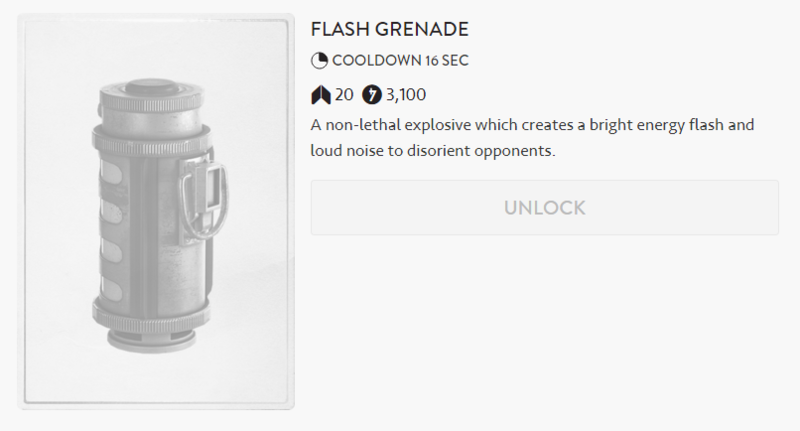 A non-lethal explosive which creates a bright energy flash and loud noise to disorient opponents. 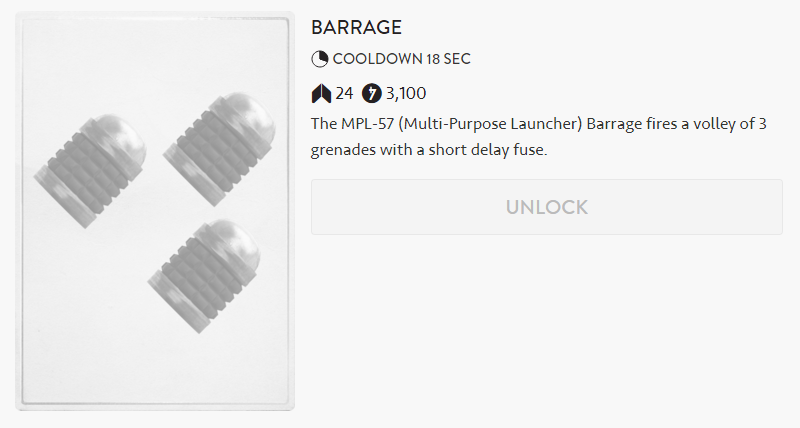 The MPL-57 (Multi-Purpose Launcher) Barrage fires a volley of 3 grenades with a short delay fuse. 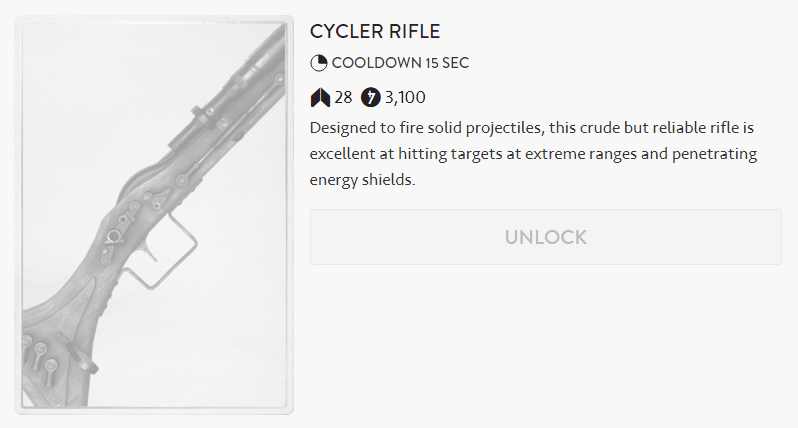 Designed to fire solid projectiles, this crude but reliable rifle is excellent at hitting targets at extreme ranges and penetrating energy shields. 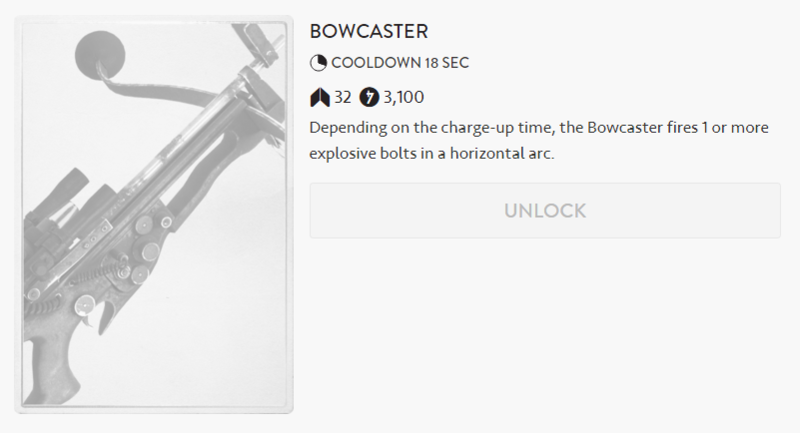 Depending on the charge-up time, the Bowcaster fires 1 or more explosive bolts in a horizontal arc. 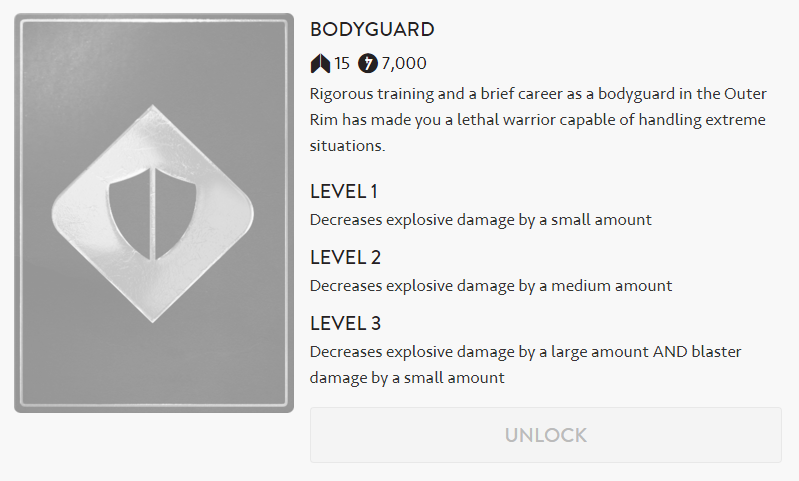 Rigorous training and a brief career as a bodyguard in the Outer Rim has made you a lethal warrior capable of handling extreme situations. 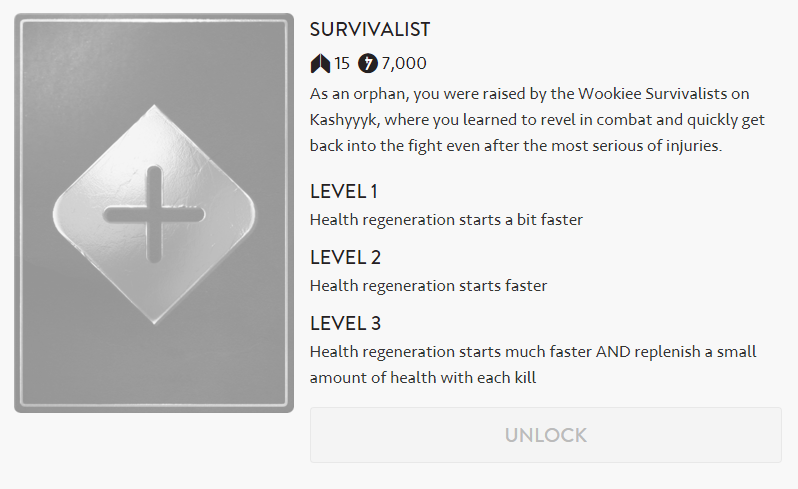 As an orphan, you were raised by the Wookiee Survivalists on Kashyyyk, where you learned to revel in combat and quickly get back into the fight even after the most serious of injuries. During a brief stint in an elite reconnaissance unit, you learned how to use stealth tactics to find and eliminate the enemy. 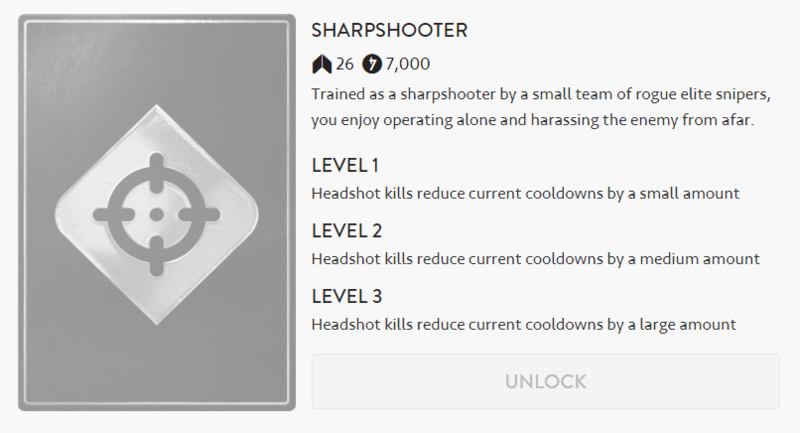 Trained as a sharpshooter by a small team of rogue elite snipers, you enjoy operating alone and harassing the enemy from afar. 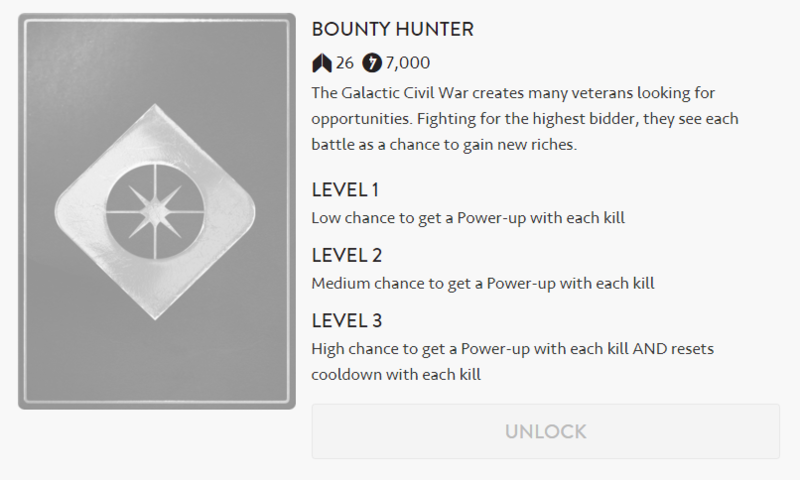 The Galactic Civil War creates many veterans looking for opportunities. Fighting for the highest bidder, they see each battle as a chance to gain new riches. The Mark II is a deployable blaster cannon that uses devastating firepower to keep the enemy at bay. 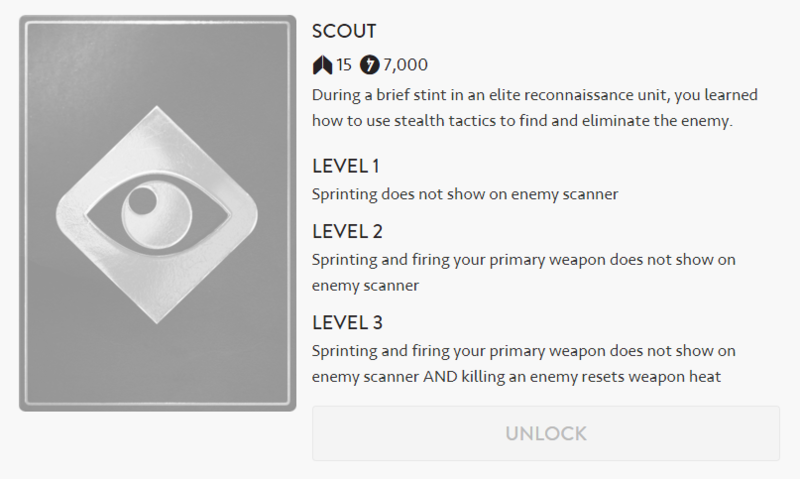 Automatically detects and attacks enemy soldiers. A lethal cannon barrage from planetary orbiting ships, covering a large area. A powerful explosive that triggers when enemies are nearby. This Droid patrols the immediate surroundings, scans for enemies, and attacks them on sight. A rocket that can be dumb-fired at any target. Automatically switches to guided mode when it detects an enemy vehicle. Portable energy shield that protects users from blasters and other energy weapons. The Thermal Imploder compresses and heats the surrounding atmosphere, creating a vacuum that produces a violent implosion within a massive radius. Automatically scans for and attacks enemy vehicles.